The ITCZ (Intertropical Convergence Zone) play important role in the global circulation system and also known as the Equatorial Convergence Zone or Intertropical Front. It is a basically low pressure belt encircling Earth near the Equator. It is a zone of convergence where the trade winds meet. Here, we are giving the concept, causes and impact of ITCZ (Intertropical Convergence Zone) for general awareness. What is ITCZ (Intertropical Convergence Zone)? It is a zone between the northern and southern hemisphere where winds blowing equator-ward from the mid latitudes and winds flowing poleward from the tropics meet. It shifts from north and south seasonally according to the movement of the Sun. 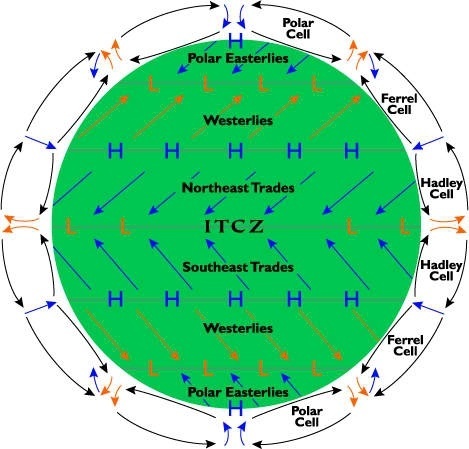 For Example- when the ITCZ is shifted to north of the Equator, the southeast trade wind changes to a southwest wind as it crosses the Equator. The ITCZ shifts only between 40° to 45° of latitude north or south of the equator based on the pattern of land and ocean. What is Cloudburst and how cloudburst different from normal rainfall? What causes ITCZ (Intertropical Convergence Zone)? 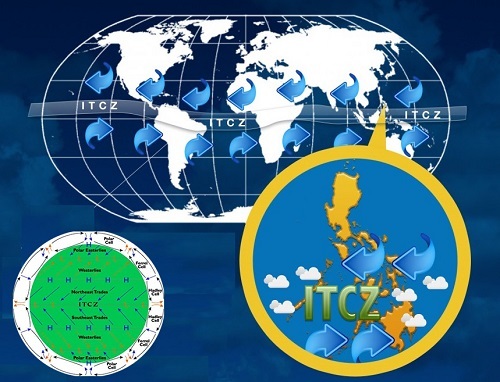 ITCZ (Intertropical Convergence Zone) is caused by the convergence of northeast and southeast trade winds in the area encircling Earth near the Equator. For better understanding, we must know about the trade winds and air masses. 1. Trade Winds: Easterly winds that circle the Earth near the equator. 2. Air Masses: A volume of air defined by its temperature and water vapour content. In tropical latitudes this air mass is hot to very hot, with high relative humidity, bringing unstable weather. 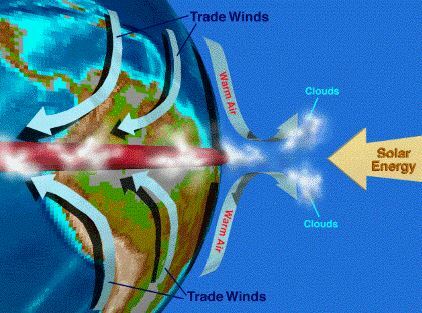 It appears as a band of clouds consisting of showers, with occasional thunderstorms, that encircles the globe near the equator due to the convergence of the trade winds. What is Tide, why it occurs and how it is important for human life? What are the impacts of ITCZ on weather? 1. It affects rainfall in equatorial region due to the variation of location resulting in the wet and dry seasons of the tropics rather than the cold and warm seasons of higher latitudes. What is Hurricane and how it is formed? 2. Longer term changes resulted severe droughts or flooding. 3. It helps in the formation of cyclone because it is a zone of wind change and speed. The ITCZ is a narrow zone where trade winds of two hemispheres collide which causes erratic weather patterns with stagnant calms and violent thunderstorms. It is characterised by convective activity which generates often vigorous thunderstorms over large areas. It is most active over continental land masses by day and relatively less active over the oceans. 3022 Views What is Money Laundering and how is it done? 2682 Views What are Grey List and Black List of the Financial Action Task Force?